When it comes to getting the job done right, you can count on the high performance, hard-working products from Carlisle. We now offer you more than 20,000 professional grade tools born of a tradition of 50 years experience in the international foodservice industry. CDN’s high-precision thermometers help ensure food safety, best culinary results and energy efficiency. Their digital and mechanical timer collections demonstrate their understanding of foodservice preparation and cooking and they are committed to developing new technology in time and temperature to meet the needs of the foodservice industry. Flexsil-lid is an award winning product, originally from Australia, designed to reduce costs and keep food fresher! Made from Food Grade silicon and using its patented “lip-lock” design, the Flexsil-lid is a lid designed to fit all Gastronorms or Steam Pans, covering the contents to maintain freshness longer when stored, or speed up the cooking times if used in ovens. This is achieved by trapping the heat inside the pan acting as an incubator. Designed to withstand temperatures down to -40°C (-40°F) if used in freezers and up to 220°C (428° F) when cooking in ovens, this environmentally friendly and hygienic product eliminates the use of excessive amounts of plastic film wrap to keep food fresh or foil to cook with. 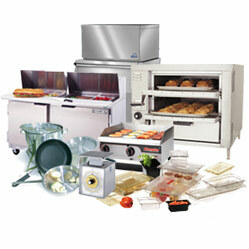 We offer a full range of products which include: cookware, chafers, steam table pans, baking supplies and smallwares.